Line your engine compartment to reduce noise levels. This flexible composite combines the sound-absorbing properties of open-cell polyurethane foam and the noise barrier capabilities of high-density PVC vinyl sheeting. The 3/32" flexible vinyl sheet is fused between two layers of foam—an exterior (“decoupler”) layer and an interior (“absorber”) layer. The interior layer is then covered with a thin film (2.5 mil) of mylar, reinforced with elastomer-coated fiberglass for surface heat protection and enhanced sound absorption. 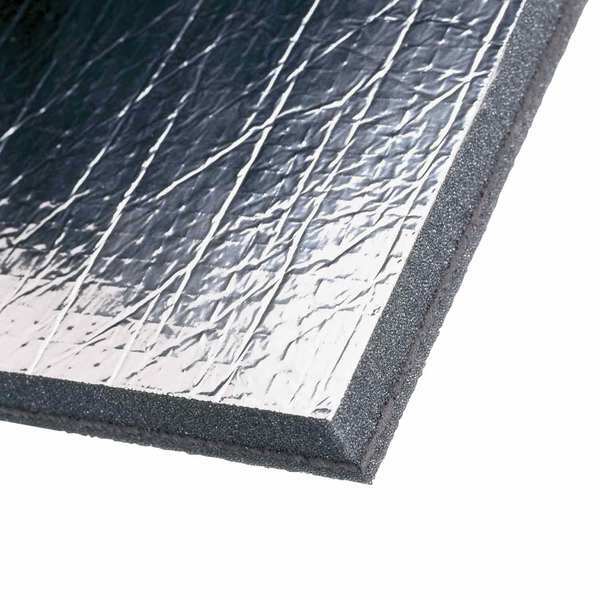 The overall effect is a dramatic noise reduction when compared with single-layer foam barriers. Material is fire retardant (not fireproof) up to 225°F. Available in two overall thicknesses. Decoupler thickness is 1/4"; Absorber thickness is 1/4" on the 1/2" kit, 3/4" on the 1" kit. Peel-and-stick backing for easy installation. When using overhead, nail hangers should be used.